The CMR Mobile Industry Consumer Insight (MICI) is a comprehensive nationwide survey of smartphone consumers, across six metros, provides a compelling portrait of changing consumer aspirations, preferences and challenges, and dislikes around premium smartphone brands. 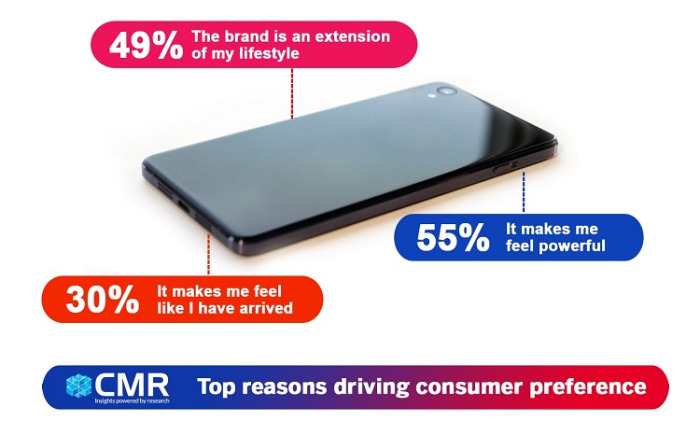 As per the latest CMR Mobile Industry Consumer Insight (MICI) Survey findings, consumers are not focusing on smartphone specifications, but interestingly looking at premium smartphone brands as devices that “make them feel powerful” (55%), as “an extension of their lifestyle” (49%),and makes them feel like “they have arrived” (30%). Among upcoming smartphone brands, the one that consumers are keenly looking for is OnePlus (36%), followed by Apple (34%) and Samsung (18%). The OnePlus appeal and promise is very high among consumers. 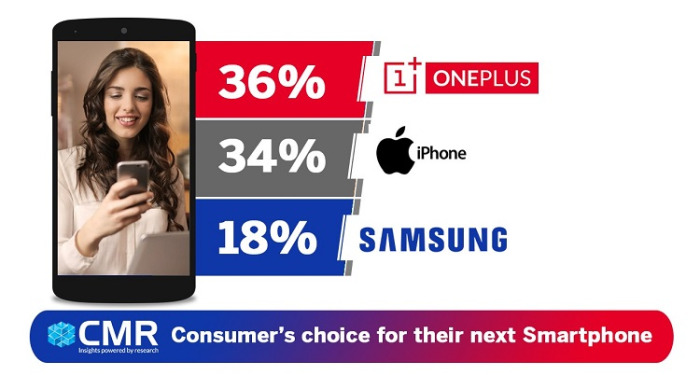 In the age group of 18-32, 59% of those surveyed favor OnePlus, and it reigns supreme as the brand of choice for aspirational buyers seeking to buy premium smartphones. In addition, there is an interesting and significant bump for OnePlus in the >40 age group, with 15% of those surveyed indicating OnePlus as their choice for their next smartphone. This trend points to OnePlus’s growing and enduring brand salience, a definite worrying sign for other premium Smartphones, with its appeal cutting across consumer segments. 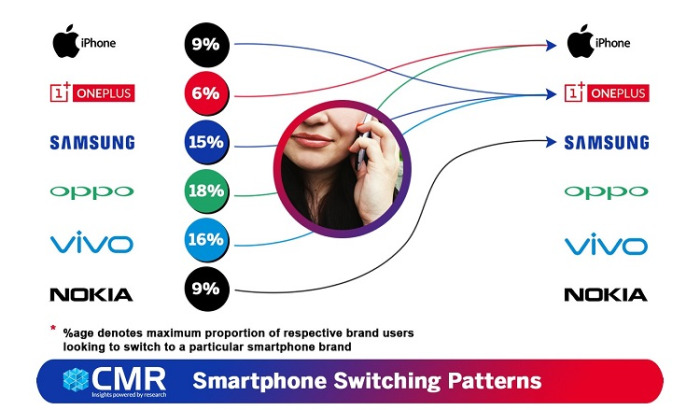 While all premium smartphone brands enjoy significant brand loyalty amongst their users, there is a small percentage of users who are considering switching to other brands. Amongst such users, the maximum traction to a particular smartphone brand was studied. While Apple emerged as a potential choice for OnePlus users (6%) and Oppo users (18%), OnePlus stands to gain from brand switching by users currently using Apple (9%), Samsung (15%) and Vivo (16%). It is interesting to note that a small percentage of current Apple users considering switching to OnePlus. Samsung stands to gain from brand switching by Nokia users (9%). Consumers look up to Apple as “the industry leader” (89%), noting it for its “innovation” (78%). Amongst women, Apple is known for its “camera” (77%). On the other hand, Samsung was noted by survey respondents for its “durability” ( 74%), and “high repeat purchase value” (46%). Amongst students, 55% noted Samsung for its “long usable life”. Consumers consider OnePlus as the “brand that one can flaunt” (65%). The MICI Survey findings also allude to the fact that smartphone upgrades are driving the market, with consumers wanting to upgrade to a premium smartphone with good build and design that provides exceptional speed and performance, and amazing gaming experience. 83% of those surveyed indicated upgrading their smartphone every 1-2 years. In comparison, there are few consumers looking to replace their existing brands because of recurring problems, or since it has been a long time since they bought their last phone. Among those using premium Smartphones costing >INR 50,000, 12% are considering switching to the OnePlus brand. The most anticipated features that consumers are seeking include in-screen fingerprint sensor, wireless charging and support for AR/VR. The MICI Survey was conducted across New Delhi, Mumbai, Pune, Bengaluru, Hyderabad and Chennai in August 2018, and cut across students, teens and working professionals.